We can love our enemies, bear a cross, overcome our body, and spread the gospel of the Lord. These are positive behaviors coming from our belief in the Lord, and being able to behave this way signifies that our faith in the Lord is true. These good behaviors may appear correct to others and as if they are in line with the word of God, but it does not mean that we are putting God’s words into practice and following the will of the heavenly Father, nor does it mean that we have quit our sinful nature and become cleansed. When observing others’ good behavior we can’t merely look at their external presentation; we must also look at their intentions and ultimate purposes. If one’s intention is to obey, love, and satisfy God, then this kind of good behavior is practicing the truth and obeying the will of the heavenly Father. On the other hand, if one’s good behavior is only for the sake of blessings, for being crowned and rewarded, and is not from a loving heart for God, then this kind of “good behavior” is like the hypocrisy of the Pharisees rather than practicing the heavenly Father’s will. If merely exhibiting good behavior means that we are following the will of the heavenly Father and that we are cleansed, then why do we often commit sins and resist God? Why do we still lead lives of sinning by day and confessing by night? This adequately shows that simply exhibiting good behaviors does not mean that we are practicing the truth and living out the reality of God’s word, nor does it mean that we know God or have a heart of reverence for Him, much less the ability to love and obey Him. As the words of Almighty God say: “Changes in nothing more than behavior are unsustainable. If there is no alteration in people’s life disposition, then sooner or later their wicked side will show itself. Because the source of the changes in their behavior is fervor, coupled with some work by the Holy Spirit at the time, it is extremely easy for them to become fervent, or to show kindness for a time. As the unbelievers say, ‘Doing one good deed is easy, what’s hard is doing a lifetime of good deeds.’ People are incapable of doing good deeds their whole life. Their behavior is directed by the life; whatever their life is, so is their behavior, and only that which is revealed naturally represents the life, and one’s nature. Things that are fake cannot last. … Behaving well is not the same as obeying God, much less does it equal being compatible with Christ. Changes in behavior are based on doctrine, and born of fervor—they are not based on the true knowledge of God, or upon the truth, much less do they rest on the guidance of the Holy Spirit. Even though there are times when some of what people do is directed by the Holy Spirit, this is not the expression of the life, much less is it the same as knowing God; no matter how good a person’s behavior, it does not prove that they obey God, or that they put the truth into practice” (“The Difference Between External Changes and Changes in Disposition” in Records of Christ’s Talks). Almighty God’s words clearly explain to us the essence and the root of good behavior. Man’s good behavior comes from enthusiasm and it is a practice based on doctrine and rules, not from comprehension of the principles of practice after understanding many truths, or from the desire to love and satisfy God because of understanding His will. Good behavior stems from man’s notions and imaginations, and these come from man’s own opinions and his corrupt nature. Therefore no matter what man does, whatever pain he suffers or whatever price he pays, it is not practicing the truth. It is not submitting to God and it does not come from the Holy Spirit’s work. Even when we exhibit good behavior and are able to follow some rules, appearing to be very pious and spiritual, we are still prone to committing sin and resisting God because of our inveterate corrupt satanic disposition, our unresolved sinful nature, and a lack of true understanding of God. We have seen many well-behaving people who still frequently commit sins and confess their sins after believing in God. This is an undeniable fact. Behaving well while still sinning and resisting God is adequate proof that they are not following the will of the heavenly Father, and they cannot gain the praise of God. The Jewish Pharisees were law-abiding people with impeccable behaviors superficially. However, when the Lord Jesus came to work, why did they frantically resist, condemn, scheme against, and then crucify the Lord Jesus? This shows that the nature of resisting God was innate in them. Regardless of how well they were behaving overtly, it did not mean that they understood, obeyed or were compatible with God, much less followed God’s will and became cleansed. If we want to resolve our sinful nature and become cleansed, we must experience God’s work of judgment and chastisement in the last days, understand the ample truths therein and gain true knowledge of God, thus begetting true obedience and fear of God. Otherwise the deep-rooted corrupt disposition of Satan within us can never be cleansed or transformed, and we will never be after God’s heart or admitted into the kingdom of God. The Lord Jesus just did the work of redemption. Therefore, during the Age of Grace, we couldn’t break free from our sins and moreover we couldn’t attain purification, regardless of how we strived or read the Bible. According to the steps of His management plan for saving humanity, God predestined the work of judgment that begins at God’s house to purify and transform men and help them out of sin and attain purification. 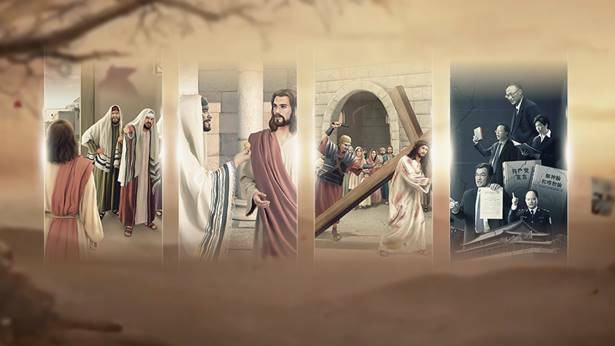 It is just as Almighty God says: “Though Jesus did much work among man, He only completed the redemption of all mankind and became man’s sin offering, and did not rid man of all his corrupt disposition. Fully saving man from the influence of Satan not only required Jesus to take on the sins of man as the sin offering, but also required God to do greater work to completely rid man of his disposition, which has been corrupted by Satan. And so, after man was forgiven his sins, God has returned to flesh to lead man into the new age, and begun the work of chastisement and judgment, and this work has brought man into a higher realm. All those who submit under His dominion shall enjoy higher truth and receive greater blessings. They shall truly live in the light, and shall gain the truth, the way, and the life” (Preface to The Word Appears in the Flesh). “Through the sin offering, man has been forgiven his sins, for the work of the crucifixion has already come to an end and God has prevailed over Satan. But the corrupt disposition of man still remaining within him, man can still sin and resist God, and God has not gained mankind. That is why in this stage of work God uses the word to expose the corrupt disposition of man, causing him to practice in accordance with the right path. This stage is more meaningful than the previous one, as well as more fruitful, for now it is the word that directly supplies man’s life and enables the disposition of man to be completely renewed; it is a much more thorough stage of work. Therefore, the incarnation in the last days has completed the significance of God’s incarnation and completely finished God’s plan of management for man’s salvation” (“The Mystery of the Incarnation (4)” in The Word Appears in the Flesh). From God’s words, we can see that the Lord Jesus’ work of redemption set the foundation for God’s work of salvation in the last days and the work of judgment in the last days is the core, the focal point, of God’s work of salvation. It is the key, the most important part of the salvation of mankind. Through experiencing God’s work in the Age of Grace, we are forgiven of our sins, but we cannot be freed from them, nor can we attain purification. Only God’s work of judgment in the last days can work the necessary truth into us, allow us to really know God, change our life dispositions, obey and worship God, and be after God’s heart. That is how God will complete His management plan to save mankind. If we only accept the Lord Jesus’ redemptive work in the Age of Grace, but do not accept Almighty God’s work of judgment and chastisement in the last days, we will not be able to free ourselves from sin, do the heavenly Father’s will, and enter God’s kingdom. This is beyond doubt! That’s because during the Age of Grace, the Lord Jesus did His work of redemption. Due to the stature of the people at that time, the Lord Jesus only gave them the way of repentance, and asked people to understand a few rudimentary truths and paths to practice them. For example: He asked people to confess their sins and repent and bear the cross. He taught them about humility, patience, love, fasting, baptism, etc. These are a few very limited truths that people of that time could understand and attain. The Lord Jesus never expressed other deeper truths that have to do with changing life disposition, being saved, becoming cleansed, being made perfect, etc., because at that time, the people lacked the necessary stature to bear those truths. Man must wait until the Lord Jesus returns to do His work in the last days. He will bestow upon corrupt mankind all the truths they need to be saved and perfected according to God’s management plan of saving mankind and the needs of the corrupt mankind. It is just as the Lord Jesus said, “I have yet many things to say to you, but you cannot bear them now. However, when He, the Spirit of truth, is come, He will guide you into all truth: for He shall not speak of Himself; but whatever He shall hear, that shall He speak: and He will show you things to come” (Jhn 16:12–13). The Lord Jesus’ words are very clear. During the Age of Grace, the Lord Jesus never gave corrupt humans all the truths they required to be saved. There are still many deeper, higher truths, that is, there are many truths that the Lord Jesus did not tell mankind that will allow people to be freed from their corrupt satanic dispositions and achieve purification, as well as truths that man requires to obey and know God. Therefore, in the last days, Almighty God expresses all truths necessary to save mankind. He uses these truths to judge, chastise, cleanse, and perfect all who accept Almighty God’s salvation in the last days. In the end, these people will be made complete and taken into God’s kingdom. This is how God’s management plan to save mankind shall be completed. If we only accept the Lord Jesus’ redemptive work, but do not accept Almighty God’s work of judgment in the last days, we will never be able to obtain the truths and change our disposition. We will never become one who does God’s will and will definitely never be qualified to enter God’s kingdom. People of the last days have been deeply corrupted by Satan; we are filled with Satan’s poison. Our viewpoints, principles of survival, outlook on life, values, etc., go against the truth and are in enmity to God. All of us worship evil and have become enemies of God. If humanity that is full of corrupt satanic disposition, does not experience Almighty God’s judgment and chastisement and burning and cleansing by words, how can they rebel against Satan and free themselves from its influence? How can they revere God, shun evil, and do God’s will? We can see that many people have believed in the Lord Jesus for years, but despite the fact that they enthusiastically testify that Jesus is the Savior and work hard for many years, their failure to know God’s righteous disposition and revere God still causes them to judge and condemn God’s work and deny and reject God’s return when Almighty God carries out His work in the last days. They even re-crucify Christ on the cross when He returns in the last days. This is enough to show that if we do not accept Almighty God’s work of judgment and chastisement in the last days, the source of our sin and satanic nature will never be resolved. Our resistance to God will cause us to perish. This is a fact that no one can deny! Among us believers, only those who honestly accept God’s judgment and chastisement in the last days will obtain the truth as life, become those who do the heavenly Father’s will, and become the ones who know God and are compatible with Him. They are the ones who will be qualified to share in God’s promise and be taken into His kingdom. Are this purification that people of religion speak of and the purification that God demands the same thing? They are not the same. The purification of which man speaks is not true purification. If you truly attained purification in believing in the Lord Jesus, would God still need to do the work of the last days? You’ve been a believer in the Lord Jesus for barely a handful of years, yet you say that you have changed and that you will attain purification by pursuing in this way. Then have a look at all the pastors who believe in the Lord Jesus, and those who have believed in the Lord for all their lives: Are they purified? Which of them is purified? Who among them dares to say that, having believed in the Lord his whole life, he is purified, and has been completely saved? You will not find a single person like this. They have believed in the Lord their entire lives and yet they dare not say that they are purified. Does it make sense to say that you will arrive at purification by practicing faith this way? If a son or daughter were to say “I’ve been out in society for a number of years and I’ve seen through society,” would this not be naive? You can ask your father and mother and those who are much older than you, have they seen through society? If none of them have, are you able to? Man does not understand the truth and does not know what true purification is. He believes that if he exhibits some good behaviors, does not get into fights in his faith, does not steal things, does not curse at people, and does not drink, then he is purified. This does not represent purification. What does genuine purification refer to? This involves a truth. True purification refers to being free of Satan’s toxins. The satanic logic in men’s hearts, Satan’s philosophy, various satanic fallacies, Satan’s laws for man’s life, and the outlook and values for life that are of Satan—are these not Satan’s toxins? What governs man’s sinning and resistance to God? It is Satan’s toxins within man that drive man to sin, that lead man to judge, misconstrue, and disobey God. The satanic nature within humans is the source of their sinning. In the eyes of God, all things belonging to Satan are dirty and evil, and man has all sorts of Satan’s toxins within. These toxins of Satan have taken root within man, flowered, and produced fruit, so humanity has become corrupted mankind, dirty mankind, evil mankind, and therefore mankind is capable of resisting God and being an enemy of God. This is a fact. So based on this fact, what problem do we see that man must resolve to achieve genuine purification? He needs to resolve Satan’s toxins, to resolve Satan’s values and outlook on life, Satan’s logic and laws, and Satan’s various fallacies. Completely removing these things from the hearts of men is being truly purified. If they are not cleared out, man will still be capable of resisting God, judging God, being an enemy of God, and betraying God. Only once the things of Satan have been cleared out, when they have been resolved, can mankind be considered to be a truly purified mankind. Is it possible to resolve Satan’s toxins through faith in the Lord Jesus? Can faith in the Lord Jesus change man’s outlook on life and values? Can it lead man to truly obey God and not resist Him? Can it lead man to truly know God, to worship God? By believing in the Lord Jesus you have only had your sins forgiven; in order to truly resolve man’s corruption and let them gain purification, God needs to perform His work of judgment and chastisement in the last days. Without the work of the last days, corrupted mankind cannot obtain purification. That is to say, purification is not just obtained through the forgiveness of sins; rather, true purification is obtained by means of ridding man of his corrupt disposition through judgment and chastisement. When man’s corrupt disposition is resolved, he will no longer resist God, he will be able to obey God, he will be able to love God in his heart, and he will be able to love the truth. Only this is purified mankind. Some fail to understand what is referred to as purification, believing that to be purified is not stealing or plundering, not breaking things, and not beating or cursing at others. Is this correct? This is a long way off the mark; they are only looking at the surface of the problem. Without the truth, people look at things too simplistically. They do not see the source or the essence; therefore, it is hardly surprising that religious people could think in this way. Previous：Question 13: We follow the example of Paul and work very hard for the Lord spreading the gospel, bearing witness to the Lord, and shepherding the Lord’s churches, just as Paul did: “I have fought a good fight, I have finished my course, I have kept the faith.” (2Ti 4:7). Is this not following the will of God? This kind of practice should mean that we are qualified to be raptured and enter into the kingdom of heaven, so why must we accept God’s work of judgment and purification in the last days before we can be brought into the kingdom of heaven? Next：Question 15: You give testimony that the Lord has returned in the flesh to express the truth and do the work of judgment and purification of man in the last days, but the religious pastors and elders believe that He will return coming with clouds, and that all believers will instantly change form and be raptured up into the clouds to meet with the Lord. Just as Paul said: “For our conversation is in heaven; from where also we look for the Savior, the Lord Jesus Christ: Who shall change our vile body, that it may be fashioned like to His glorious body, according to the working whereby He is able even to subdue all things to Himself” (Phl 3:20–21). The Lord is almighty and there is nothing He cannot do. God can transform us and make us purified with a single word, so why would He still need to become flesh to express the truth and carry out a stage of work of the judgment and purification of man? What are evil deeds? What are the manifestations of evil deeds? What is the standard by which a person’s acts are evaluated as good or evil? It is whether or not you, in your thoughts, expressions, and actions, have the testimony of putting truth into practice and of living out the reality of truth. If you do not have this reality or do not have this living out, then you are without a doubt an evildoer.